The full five decade rosary is a form of vocal and mental prayer, used for devotional prayer and for meditating on the Mysteries. The rosary is an old prayer that is always new, leading us to Jesus through Mary. If you need any special requirements, please don't hesitate to email me and I'll be happy to help. A unique one off piece. Measuring approx. 49cm in length, this beautiful handmade rosary is constructed from 8mm amethyst gemstone beads, fossil crinoid, sunstone, mookaite, brown snowflake obsidian and AB crystal spacer beads. 10mm lepidolite coin beads are used for each Pater (Our Father). 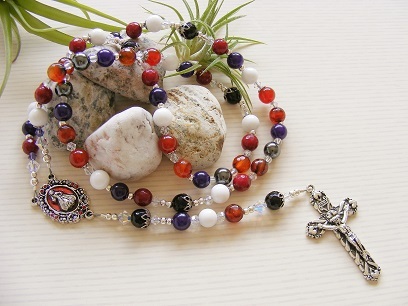 A large silver plated crucifix and a full colour Divine Mercy centerpiece compliments this exquisite rosary. Please click on image for a larger view. Measuring approx. 49cm in length, this beautiful handmade rosary is constructed from 8mm Chrysanthemum stone gemstone beads, bamboo leaf agate, faceted hematite and clear quartz crystal spacer beads. A silver plated cross replica of the crucifix worn by Pope Francis featuring Jesus the Good Shepherd completes the rosary. Comes with a free gift box. Please click on image for a larger view. A unique one off piece. Measuring approx. 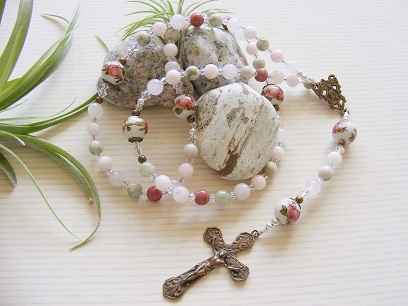 48cm in length, this beautiful handmade rosary is constructed from 6mm rose quartz gemstone beads, peace jade, white jade, pink rhodonite and clear Swarovski crystal spacer beads. Glass rose floral beads are used for each Pater (Our Father). A small ornate hand cast bronze crucifix and a reversible bronze centerpiece (Jesus on one side, Mary on the other) compliments this rosary. The crucifix and centerpiece have been hand cast in America from antique pieces. Measuring approx. 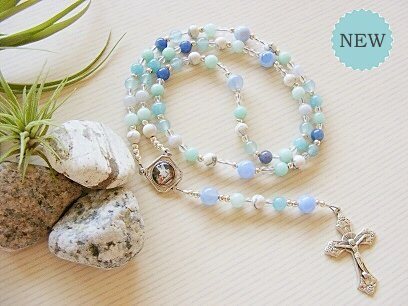 41cm in length, this beautiful handmade rosary is constructed from 6mm chinese amazonite, blue aventurine and howlite with 3mm clear quartz spacer beads. 8mm blue lace agate beads are used for each Pater. A highly detailed crucifix and a full colour Guardian Angel centerpiece completes this lovely rosary. Comes with a FREE deluxe gift box. Measuring approx. 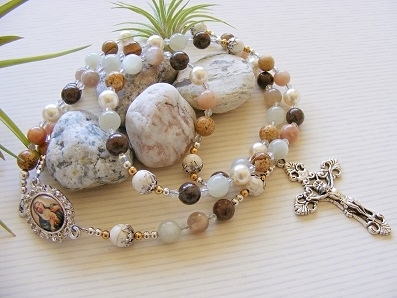 48cm in length, this beautiful handmade rosary is constructed from 8mm magnesite gemstone beads, picture jasper, spider web jasper, 8mm fossil crinoid beads and white jade spacer beads. Snowflake obsidian encased in fluted bead caps are used for each Pater. A stunning white gold enamel crucifix and full colour centerpiece featuring Pope Francis compliments this exquisite rosary. Please click on image for a larger view. Measuring approx. 48cm in length, this beautiful handmade rosary is constructed from 8mm unakite gemstone beads, bronzite, hematite and brass spacer beads. 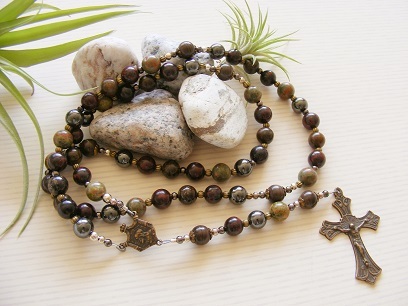 Coffee bean jasper beads are used for each Pater (Our Father). An ornate hand cast bronze crucifix and a reversible bronze centerpiece (Jesus on one side, Mary on the other) compliments this rosary. The crucifix and centerpiece have been hand cast in America from antique pieces. Measuring approx. 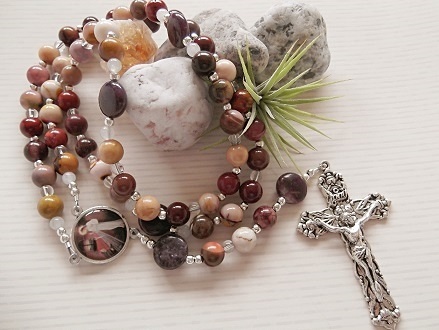 41cm in length, this beautiful handmade rosary is constructed from 6mm picture jasper beads, fossil crinoid, bronzite and 3mm silver spacer beads. 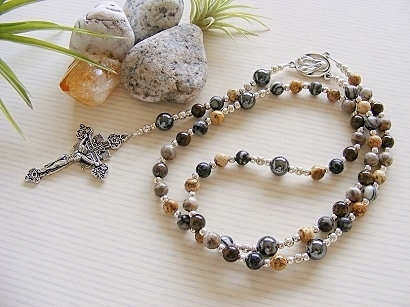 8mm hematite beads are used for each Pater. 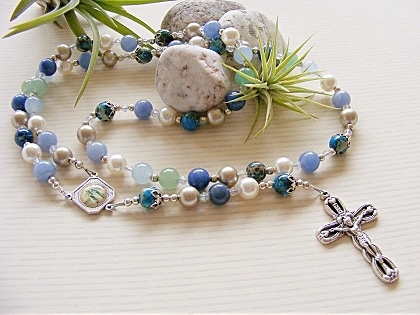 A highly detailed crucifix and silver plated centerpiece compliments this lovely rosary. Please click on image for a larger view. 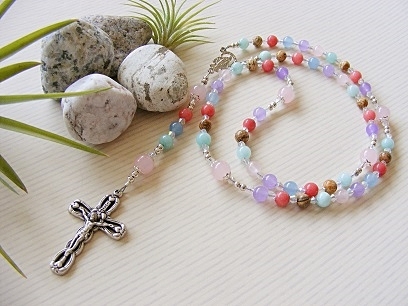 Measuring approx.40cm in length, this beautiful handmade rosary is constructed from 6mm pink and purple jade, rose quartz, amazonite and picture jasper. Bicone crystal spacer beads, a highly detailed crucifix and silver plated centerpiece compliments this lovely rosary. Please click on image for a larger view. SOLD OUT Measuring approx. 45cm in length, this beautiful rosary is constructed from 8mm green and blue aventurine beads, with Swarovski white and platinum pearl beads. 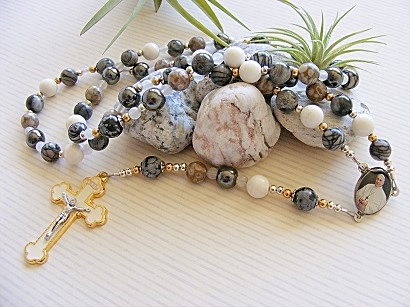 Blue impression jasper beads are used for each Pater (Our Father beads). 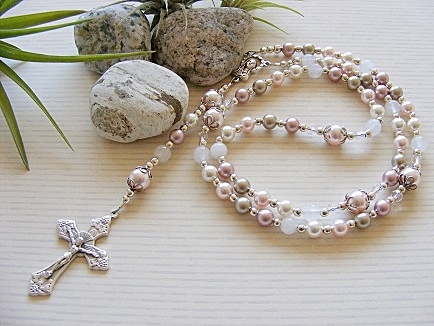 A delicate silver crucifix and a full colour Our Lady of Grace centerpiece compliments this lovely rosary. Please click on image for a larger view. Measuring approx. 41cm in length, this beautiful handmade rosary is constructed from 6mm black onyx beads, hematite, bronzite, red creek jasper beads and 3mm silver spacer beads. 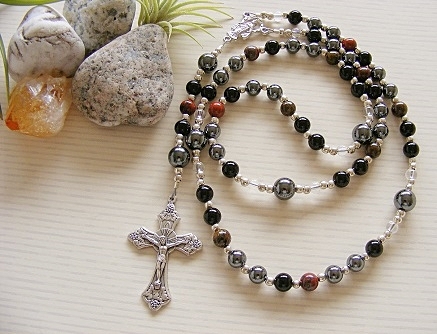 8mm hematite beads are used for each Pater. 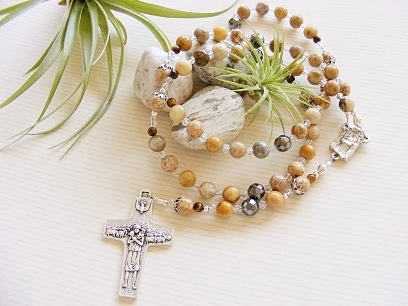 A highly detailed crucifix and silver plated centerpiece compliments this lovely rosary. Please click on image for a larger view. Measuring approx. 45cm in length, this beautiful rosary is constructed from 8mm carnelian beads, with white jade, purple jade, faceted dream agate and hematite beads. Faceted black onyx beads are used for each Pater (Our Father beads). An ornate silver plated crucifix and a full colour red enamel Miraculous centerpiece compliments this exquisite rosary. Please click on image for a larger view. Measuring approx. 41cm in length, this beautiful handmade rosary is constructed from 6mm white jade beads, Swarovski pearls beads in pink, mink and ivory colours. Silver plated spacer beads, a highly detailed crucifix and silver plated centerpiece compliments this lovely rosary. Please click on image for a larger view. A unique one off piece. Measuring approx. 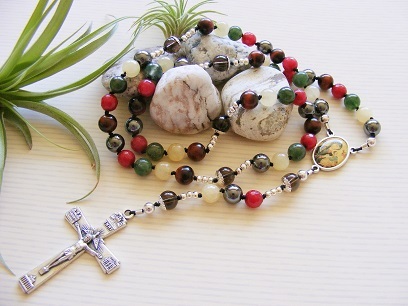 54cm in length, this beautiful handmade knotted rosary is constructed from extremely strong beading cord individually hand knotted between each Ave. Lovingly created from 8mm faceted ruby jade gemstones, tiger eye, moss agate, hematite and ambronite beads. Smoky quartz are used for each Pater with silver scallop bead caps. A silver plated ornate crucifix and a full colour Our Lady of Perpetual Help centerpiece compliments this exquisite rosary. SOLD OUT Measuring approx. 48cm in length, this beautiful handmade rosary is constructed from 8mm sunstone gemstone beads, picture jasper, brown snowflake obsidian, moonstone, Swarovski pearls and AB crystal spacer beads. Magnesite beads are used for each Pater (Our Father). An ornate silver plated crucifix and a full colour ornate Sacred Heart of Mary centerpiece compliments this exquisite rosary. Please click on image for a larger view. Measuring approx. 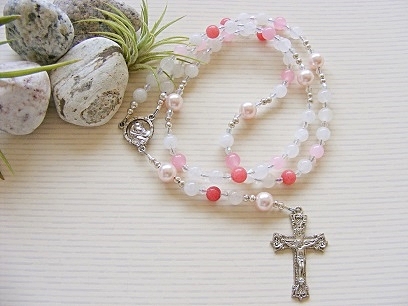 40cm in length, this beautiful handmade rosary is constructed from 6mm pink jade, rose quartz and white jade beads, with pink Swarovski crystal pearls for the Paters. Aurora borealis bicone crystals are used for the spacer beads and a beautiful ornate crucifix completes this lovely rosary. Please click on image for a larger view. SOLD OUT Measuring approx. 47cm in length, this beautiful handmade rosary is constructed from 8mm mookaite gemstone beads and mixed quartz spacer beads. 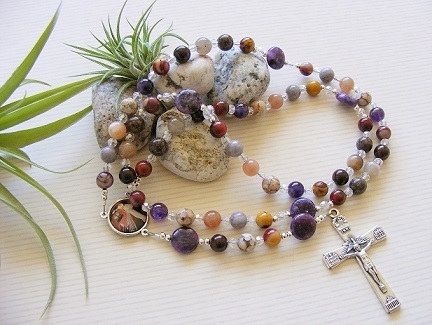 10mm lepidolite coin beads are used for each Pater (Our Father). A large silver plated crucifix and a full colour Divine Mercy centerpiece compliments this exquisite rosary. Please click on image for a larger view. SOLD OUT Measuring approx. 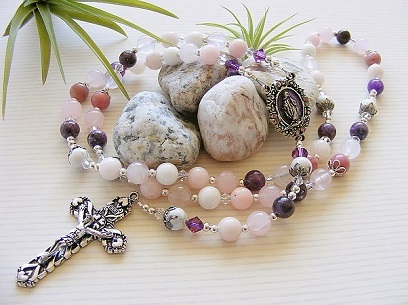 48cm in length, this beautiful handmade rosary is constructed from 8mm rose quartz gemstone beads, lepidolite, howlite, pink rhodonite, pink jade beads and Swarovski crystal spacer beads. Howlite beads are used for each Pater (Our Father). An ornate silver plated crucifix and a full colour purple enamel Miraculous centerpiece compliments this exquisite rosary. Please click on image for a larger view.